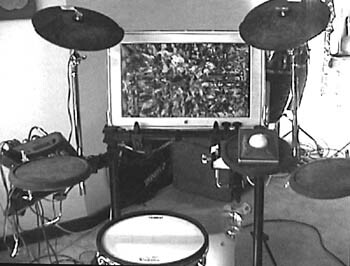 The Drumkit of Tomorrow Today! : Pounding the skins makes for purdy colors at ELSA's latest event. All the high-tech artistry in town right now has got me living in a virtual dreamworld where the old rules don't apply--dancing bodies sound like music, virtual doppelgängers cut your workload in half, wired drumsets make light shows beyond our wildest imaginings. Shoot, just the other day I got to drive a psychedelic hallucination like a car, careening wildly into spheres reflecting English gardens and fractalized clouds in the key of Beck. I haven't quite processed it all yet, but I do know one thing: the seventh installment of ELSA's ELectron SAlon series might change the way you think about music. The lead-up to the concert is a weeklong series of workshops at the Felix Kulpa Gallery, which began last Saturday (see--even time is bending) and continues with a workshop on Jitter (real-time image synthesis software) Wednesday and one on SuperCollider (real-time audio synthesis programming language for OS X) on Friday (see www.elsaproducions.com for more info). And after all the brains are thoroughly scrambled, the series culminates in the concert proper. Divided into three acts, ELectron SAlon 7 first features a brand-new Light Synthesizer program called Kazoo. Yeah, I said it: light synthesizer. Inspired by comparatively primitive Laserium shows at planetariums everywhere, Mark Buchanan (programmer, ex-NASA scientist and now lumia violinist/drummer) has created visual software with MIDI capabilities, meaning that he can control his visual effects with any MIDI-compatible interface, including keyboards, violins, drums and even motion-sensitive bodysuits. At the concert, Buchanan will present a brief history of visual instruments, and then move on to perform a visualization of Peter Gabriel's "Darkness," as well as a slow violin accompaniment to Fiona Apple's "Slow Like Honey." If you're lucky, you might be able to score a copy of Kazoo for OS X, which he will be releasing at the performance. The second set features Ducks to Water (Doug Wyatt, David Zicarelli and Jarrell Irvin on keyboards and Iwalani Falkner singing soprano vocals) playing The Continuing Story of Counterpoint (part 9). Composed by David Borden, this minimalist piece (a la Phillip Glass) features three keyboards and vocals looping hypnotically through varied time signatures and complex melodic dissonances. 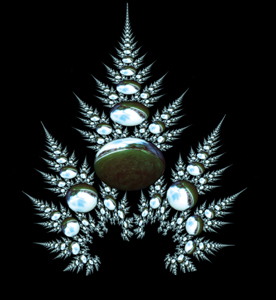 Fractal Rock: This is the kind of thing the art experimenters of ELSA come up with. The third and final set, entitled Without Ourselves: 5 verses on Digital Identity, is the conceptual coup de grâce, tackling themes of isolation and identity, artificial intelligence and the all-pervasive role of personal computing. Amazingly, some of the creators/collaborators of the piece were living overseas throughout the creation process, setting up websites, trading emails and MP3s to keep each other abreast of new developments. "It was a thing which was quite cold to do," says Emmanuel Deruty, who composed the original music for WO. "It's not very social, but it's possible." The Elsewhere Troupe describes the original composition as "a cycle of five multimedia songs for two voices, a video animated character, an actor, piano and electronics. The thematic material is the humorous extrapolation of technophobic nightmares." Frankly (or should I say, Frankensteinly), some of the music is a little beyond spooky. Not entirely unlike a dark-hearted Brian Eno, Deruty's songs invoke some sort of terrifying underworld where the mechanical and the organic combine to form a monstrously sublime sound, seductive and dreamlike, yet balanced precariously on the razor's edge of a nightmare. Deruty's music will be accompanied by the ever-ethereal wailings of local diva Aimee Page (as the ever-serene Serenity, who yearns for emotional connection with her friend Lissandra) and the classically trained vocals of local soprano singer Iwalani Faulkner (as the hyperkinetic Lissandra, whose busy lifestyle incites her to create an electronic Proxy to satisfy her friend Serenity's emotional needs). Deruty describes their vocal parts as "very elegant and light, evolving independently of the music." The third character, Proxy (Lissandra's electronic double), is animated by video artist Yasmina Dedijer-Small. By far the most enigmatic figure of the evening, Proxy resists description, but invites conceptualization thusly: "I see Proxy as this abstracted being who is supposed to fulfill all these desires and superficial needs. So I've been really resistant to creating anything illustrative or realistic. It's an element of the piece, a visual projection created with video," says Dedijer-Small, before adding, somewhat cryptically, "It takes various forms, still in discovery." The glue holding it all together? Well, that would be Veronique Larcher, producer extraordinaire and the major materializing force behind all the ELSA events. But next to her, Wayne Jackson's lyrics convey the themes of the piece with grace and, thankfully, plenty of technophobe satire. But underneath the social commentary is a reflexive inside joke, realized firsthand by the artists who struggled to collaborate via email. Indeed, the irony of the creators enduring the very technological isolation that they're critiquing is not lost on the Elsewhere Troupe. "We know what we are speaking about," laughs Deruty. "We are just expressing how we do things. So it's a real problem after all, not only an existential one." Thankfully, though, the technology of the future will solve all of humanity's problems--even the social ones--as forecast by the ominously cheerful advertising skits in between scenes. "At Applied Anthroponics," claims one happy commercial, "we're making loneliness obsolete." ELectron SAlon 7 will materialize on Saturday, June 7, at 8pm at the Rio Theatre, 1205 Soquel Ave., Santa Cruz. Tickets are $12 at the door. Advance tickets are available at Streetlight Records, $10 general/$7 students. Visit www.elsaproductions.com for more info. From the June 4-11, 2003 issue of Metro Santa Cruz.